I am incredibly grateful for this daily practice called yoga. Yoga has transformed my former exercise routine from something merely physical to an experience that feeds my body, mind and soul. Yoga replenishes my energy and stimulates my body's innate powers of healing. Over the last thirteen years, yoga has helped me overcome supposedly "permanent" physical injuries and chronic pain. My journey towards healing began twenty five years ago: While walking through a crosswalk on my 14th birthday, I was struck by an SUV, speeding through a school zone at 50mph. By all accounts, I should have died. The force of the impact shattered my spleen, broke my left kidney into unsalvageable pieces, fractured my skull, ribs, and pelvis, poked a hole in my aorta and broke my femur in half. After six hours of emergency surgery, a week in ICU, and a month in the hospital, I was released back home. Though my body healed, my bones remained problematic. Over the next few months, my femur was re-broken five times in an effort to straighten it out. Eventually, I was placed in a full body cast for six months. Several years later, my femur was re-broken one more time, and a steel rod placed inside the bone, where the marrow used to be. Two years later, the steel rod was removed. 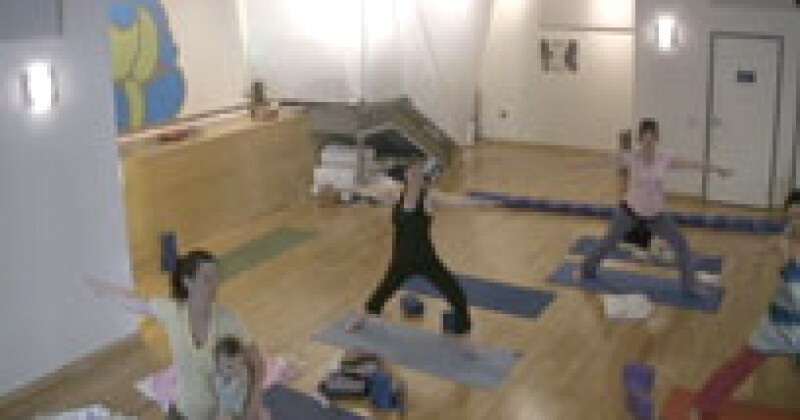 In 1998, I discovered yoga and my life forever changed. The feelings of fighting my injuries and trying to prove something to myself, began to fade. Instead, I learned to embrace my healing body. These days, I teach Kick It Up With Aria at Yogis Anonymous: a strong vinyasa flow class with attention to alignment, breath and core strength, the keys to building a healthy foundation for a lifelong yoga practice. I enjoy teaching inversions, which are great for the immune system and help rid our bodies and minds of fear; arm balances, because they help develop our confidence and strength, and backbends, for their deep healing qualities. I am a former award-winning body builder and a Yoga Alliance certified instructor. I trained with Ana Forrest (500hrs) in 2005, and Shiva Rea (120hrs) in 2004 and 2006. I draw from a variety of yoga traditions: Sivinanda, Iyengar, Vinyasa Flow, Anusara and Forrest, and am influenced by the energetic martial arts forms of Qigong and Kalari. I am also a pre/post natal yoga instructor, a guided meditation instructor, and a birth doula. I have been a freelance writer for over ten years, and currently write about health and wellness. I believe that our bodies possess an intuitive intelligence and an energy that makes all things possible. Today this therapeutic flow begins with gentle side body stretches, hip openers, stretchy, simple backbends and feel-good twists that begin to wake up every major muscle group in your body. A short, smartly sequenced flow ignites your energy as it re-aligns your skeleton. Have two blocks prepped for standing postures at the wall. Class finishes with relaxing shoulder and neck stretches. This class moves slowly enough to accommodate a woman in her 37th week of pregnancy, but is challenging enough to stimulate your body's natural healing mechanisms. Explore the interplay between the feminine (yin) and masculine (yang) energies within us all. We begin class with a grounding meditation, and move right into side body stretches and gentle spine openers. Our vinyasa sequence incorporates hip openers and lower back strengtheners, primarily through Warrior II, Triangle Pose, and Half Moon Pose with a block. Standing Tree pose and Eagle pose variation help firm our attention and create a sense of inner balance. We complete class with a heart opener and gentle backbends. Our closing meditation brings us back to the idea of inner and outer balance, feminine and masculine energies, and encourages us to incorporate balance into our lives, our births and our families. Release shoulder, neck and upper back tension in this sweetly energizing flow. Class begins with a heart opener. Using two blocks, we place one underneath our shoulder blades, and one supporting the base of our skull. Side body openers, neck stretches, and shoulder openers lead into a fun flow that opens up our hips and stabilizes our pelvic floor. We finish with a gentle backbend and a twist. Our meditation and theme today is about releasing fear and worry held inside of us. Today class is a general, all-body flow that focuses on being present through the breath. We learn to breathe into and relax different parts of our body and how to use simple yoga movements like cat/cow to not only warm up for yoga, but to manage potentially intense birth sensations. Our standing pose sequence explores Warriors I-III, with modifications given throughout. We explore a therapeutic shoulder opener at the wall, and gentle twists and hip stretches back on our mats. Our meditation reaffirms the infinite potential inside all of us and reminds us to trust our bodies. Open your Hips. Stabilize Your Pelvic Floor. Feeling tweaky in your low back? Grab two blocks and get started. Our theme today is creating inner and outer balance through opening up our hips and stabilizing the pelvic floor. Too often, a pre and post natal mom experiences tweakiness in her pelvis and low back: this is partially the result of relaxin, whose job is to loosen up the pelvis so as to prepare the body for birth. If we want to feel good and avoid back pain, it is important to learn how to open up the hips safely. To do this, we must stabilize the pelvic floor through engaging our outer hip muscles, while extending and lengthening our tailbone. Get ready to feel fantastic! Our breath practice focuses on creating balance between the sympathetic and parasympathetic nervous system. Our meditation teaches us how to safely face our fears and release them. Breathe deeper, expand your energy, and connect more easily to your body and your baby with this gentle, side body opening flow. We begin with a simple meditation to connect you to your body and your baby. Side body stretches, shoulder openers and neck release stretches take us into a gentle flow that emphasizes length and space through the side body and ribcage. Our peak pose is Parighasana, or Gate Pose. We finish with a birth visualization that allows us to visualize and focus on our most ideal birth experience. Come on baby, lets do the twist! Today class focuses on safe twists you can do during pregnancy and post-partum. Twists help wring out the body, releasing stuck areas that hold tension, tightness, stress and worry. We begin with a centering meditation to help connect you with your body and your baby. Gentle shoulder openers follow, a neck release and a core stabilization series follows. Our first twist is supremely gentle, opening up the upper back and shoulders. Our most active twist is in chair pose, or fierce pose. We end with hip openers, more twists, and a final shoulder opening sequence. Our closing meditation is a heart opening mediation that connects us to our inner strength. The focus of this class is achieving a greater sense of overall balance through the use of our breath, our intention, our strength, and our minds. We begin with a gentle meditation to help connect you and your baby. Shoulder and neck openers make way to hip openers, standing poses, and twists. We complete class with a 2 minute per-each-side pigeon pose practice. Our final meditation explores the chakras through color visualizations. A perfect morning wake & stretch. Lubricate your joints with gentle circular movements on hands and knees. A carefully designed progression of movements releases stiffness in your hips, low back, neck and shoulders. Have a strap handy for a final standing shoulder sequence. Complete your wake-up by lengthening out your hamstrings and low back with a gentle wall stretch. Backbends, twists and hip openers! Have a tightly rolled up towel or blanked handy: we begin class with a gentle heart opener, by placing the rolled up blanked underneath our shoulder blades. Abdominal core strength exercises and twists ring us out and get us ready to flow. A strong, basic flow sequence follows sprinkled with some chair, Warrior I and Warrior II poses. Class culminates in backbends, hip openers and a sweet 5 minute savasana.